OJEE Admit Card 2018: For Second/Special Test which is scheduled to be held on 22-07-2018, Odisha Joint Entrance Examination committee has released OJEE Admit Card 2018 on its official website. Applicants who fail to get rank in JEE Main 2018 and had applied for OJEE Second/Special Test they now can download either through this page or by visiting to the official website of the organization. Do not forget to download the OJEE call letter from the official website of the organization i.e. www.ojee.nic.in. If any aspirant fails to download the admit card then he will not be able to attend the exam. That’s why it is so much important for all the contenders. The authority will not allow any individual to sit in an examination hall without the OJEE admit card. 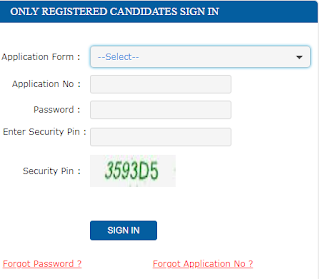 Candidates have to come along with OJEE call letter and Valid ID proof at the time of examination; otherwise he/she will not be able to attend the entrance test. ID Proof includes Aadhar Card/Pan Card/Voter ID/Driving License, individual need to bring any one ID proof from them. Total 60 questions will be asked in the question paper and every question contains 4 marks each. The test will be done on OMR sheet which is provided by the examiners. MCQ type questions will be given which means you have to select the correct option from 4 options. If any individual choose wrong answer then he will get -1 mark for each incorrect answer. Individuals can get further information about OJEE Admit Card 2018-19 through the Official Link. If you have any confusion or any suggestion then you may write to us in the comment box which is mentioned below. Bookmark this page by pressing Control plus D and for latest updates on entrance examinations you can follow us on Face book and Google plus.